Omar Khayyám was the pseudonym used by this great Persian poet, philosopher and scientist. His scientific studies in the fields of astronomy, mechanics, mineralogy and mathematics place him amongst the most influential of that time, making him worthy of the title true polymath. As well as producing poetry he wrote a number of treatises on his scientific discoveries. He was born Ghiyath ad-Din Abu’l-Fatḥ ʿUmar ibn Ibrahim al-Khayyam Nishapuri on the 18th May 1048 in Nishapur, Persia, a place which is now in the north eastern part of Iran. At that time Nishapur, which was a Seljuq capital in the Khorasan region, would have been on a par with Baghdad and Cairo for its cultural prominence. It is believed that his family were tent makers. He was educated in Samarkand, the family having moved there when Omar was quite young. It was in Bukhara though where he made his mark as one of the Islamic Golden Age’s great astronomers and mathematicians. But it was in the fields of philosophy and literature where he also came to prominence. He translated a number of works by ancient scholars into Persian and others, in turn, translated his works into English and other languages in later centuries. Most prominent of these was probably Edward Fitzgerald who, during the 19th century, made Khayyam the best known Eastern poet in the Western world. He translated, and adapted, a number of his quatrains. It has been said that he probably wrote around a thousand of these four-line verses, known by the Persian name of rubaiyat. Khayyám was active around the time of the reign of a Seljuk ruler by the name of Malik-Shah I and he was given access to the royal court as a trusted adviser and philosopher. These audiences would usually be granted in the evenings, while his daytime hours were spent either writing or teaching mathematics. Incredibly he would then spend many of his twilight hours studying the stars and working on the development of the Jalali calendar. When Malik-Shah died though, Khayyám was banished from court by the Sultan’s widow. He then set off on a pilgrimage to Medina and Mecca. This is the journey known as a Hajj which all adult Muslims must make at least once in their lifetimes and it attracts many hundreds of thousands even to this day. He was eventually welcomed back to court where he was employed as court astrologer. Following this he was back in Nishapur, a place where he was well known as at teacher of astronomy, mathematics and medical matters. His name lives on in both literary and scientific circles. Scholars pavilions have been named after him in places such as Vienna and a minor planet, discovered in 1980 by a Soviet astronomer, bears his name. Statues of him have been erected around the world, one being found in Florence and another at the University of Oklahoma. 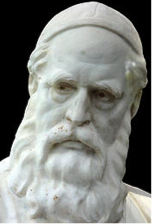 Omar Khayyám died on the 4th December 1131 at the age of 83.